Are you or your club in need of community service hours? 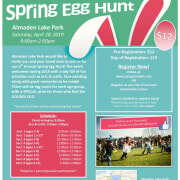 Almaden Lake Park is recruiting volunteers for our 6th Annual Spring Egg Hunt on Saturday, April 20th. Be a part of our family-fun event by helping with our egg hunts, decorating the park, arts & crafts, and other projects. There are 2 different shifts to sign up for 1)7am - 11:30am 2) 11am-3pm or let us know if you are interested in volunteering the whole day. You can sign up by emailing yazmin.rios@sanjoseca.gov or calling the Almaden Lake Park office.